I have a thing for BioWare games, I’m not ashamed to admit it. I think I played through the 2009 RPG of the Year Dragon Age: Origins about six times on PC, once on Xbox 360, but don’t start assuming that’s because I like the gameplay or anything. I hated it. I just loved the story and characters that much. 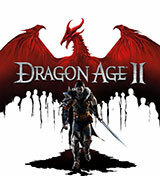 Dragon Age II begins at almost the same spot chronologically as DAO. The Darkspawn have risen in numbers and a Blight is slowly but surely creeping across the land. Forced to flee Ferelden, the Hawke family only just manage to escape before the Blight engulfs their home town. You play the eldest of three children in the Hawke family and can be a warrior, mage or rogue. I roll a rogue every time, it’s just who I am! Consequently, this means I spend a lot more time with Bethany, my younger sister, than my younger brother, for reasons you will have to discover by playing. The story revolves around Hawke (your character is called this by everyone you meet) and his/her rise to power in their adopted home of Kirkwall. The theme of DAII is heavily magic-driven and every second quest you undertake has something to do with apostates or blood mages or demons in some form or other. It can get a bit tedious at times, as can the environments—but let’s not get started on that, for fear of being here all day. I enjoy the way you can craft a character’s personality, as well as their face and class, and that’s why I keep coming back to BioWare games—see my article on Mass Effect 3. The moral choices, dialogue options (that are incredibly funny, by the way) and relationships are the things that grip me the most and give Dragon Age II its replayability. A brief note on the combat—I’m not in any sort of position of authority to tell you whether or not the gameplay is good or bad. I think it’s more a matter that this particular style of combat is not my cup of tea. Telling your squadmates what to do and hoping they do it well is just too frustrating. I prefer to think only of what I’m doing and trust my squadmates to help me in that endeavour. Hopefully, the next Dragon Age game, Inquisition, will have a combat style more like Mass Effect, though I might just have to pray a little harder to Andraste for something like that to happen!